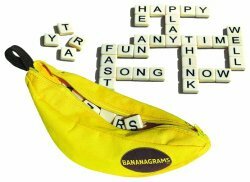 Bananagrams game is a fast and fun word game that is easy to play. No need for a board, pencil or paper just a small flat space big enough to build up a cross word of the letters. Ideally Bananagrams game is for two people but more can play. It is an immensely enjoyable game of words. Quick thinking is a important but practice will be a big help and it is such an easy way to teach spelling. Use of English and adapting words are further skills. It helps to keep the brain sharp and active. A game or round can be played in as little as five minutes. Although there is a ‘winner’, you are really pitting yourself against yourself. It is very light and easy to carry around. The game can easily fit into a handbag or big pocket. Play it waiting for a plane or waiting for a train. Banagrams game is fun, addictive and makes you think in a differet way. Lots of action and fun. This is an addictive and exciting game of words. It is different to Scrabble, it is quicker and everyone is playing all of the time rather than spending time waiting for your turn. Tiles are shared between players and each player then makes their own crossword. The crossword changes all the time as more tiles are picked up and placed into words. Quick thinking to be able to rearrange tiles to make different words. Click Bananagrams game to buy the game, its a perfect gift for crossword and word game lovers. If you like word games or games that call for an agile mind then try Banagrams game. Tell me your thoughts if you have bought this game or played it. Super game, fast & furious and great fun. It is much better than Scrabble as it is quicker and everyone is playing all of the time rather than spending time waiting for your turn. Click Bananagrams game to buy the game.